Competition prize win number 1172: I won a copy of You Say Potato book by Ben and David Crystal from Gransnet which looks like an interesting book. I find it amazing how accents are so different. When I up here in Kidderminster I sound so different to everyone with my Somerset accent but then when I go back home it's so weird to hear everyone talking like me again. It's amazing that 70 or so miles down the road people have such different accents. 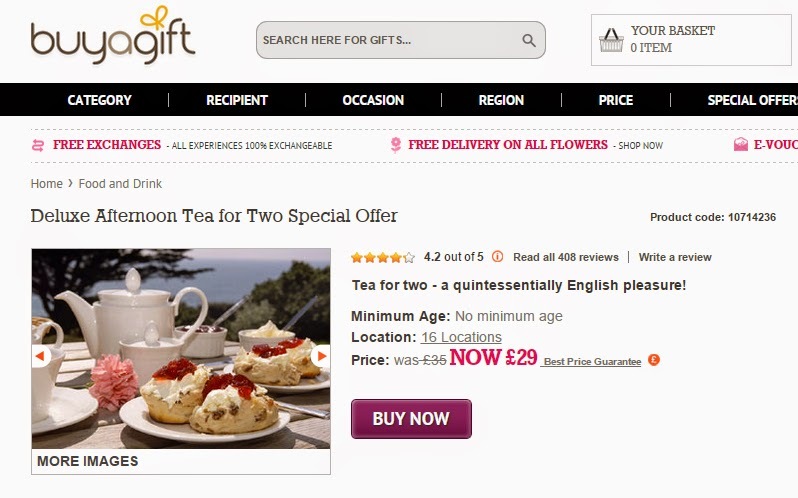 Competition prize win number 1173: I won an Deluxe Afternoon Tea for Two Voucher on the Zoflora Facebook instant win game. I am not sure where I going to use this as yet as none of the locations are near me or my family but the voucher is valid for a long time so hopefully we will be able to use it. Competition prize win number 1174: I also won a £20 John Lewis Voucher on the Zoflora Facebook instant win game. I love winning vouchers and this will be handy to use to buy a few presents for my family for Christmas. Competition prize win number 1175: I won a blu-ray copy of Love Punch from Just Competitions. I love winning films and really look forward to watching it. Competition prize win number 1176: I won a dvd of The Search For Simon which looks like a funny sci-fi film. Not sure where I won this one from. 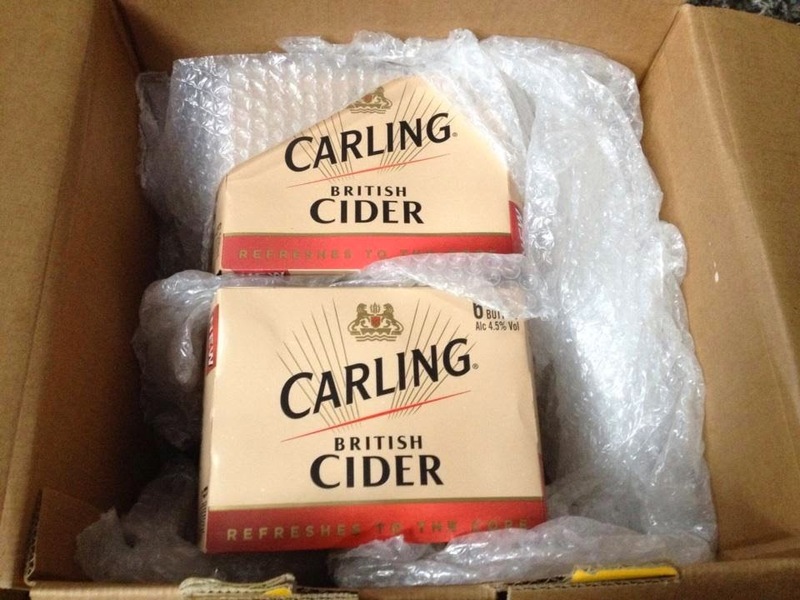 Competition prize win number 1177: And finally this week I received 12 bottles of Carling cider from a competition Carling ran on twitter. 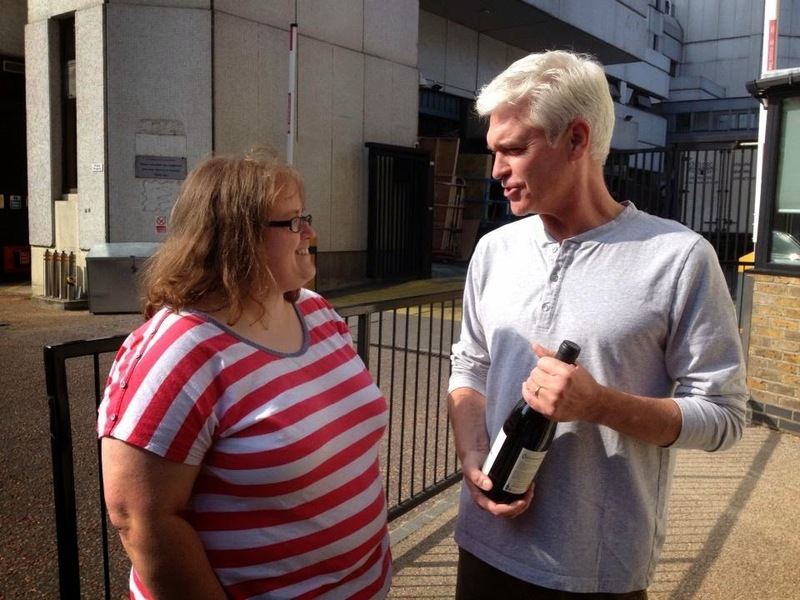 This prize is for Neil who loves cider. And that's all my wins that have arrived. Good Luck to everyone entering competitions in the next week or so. The Best of Gershwin CD from Just Competitions. Earlier this month we were sent some cans of Hills Ideal Balance Dog Food from our friends at PetShopBowl to try out with our dog, Shortie. 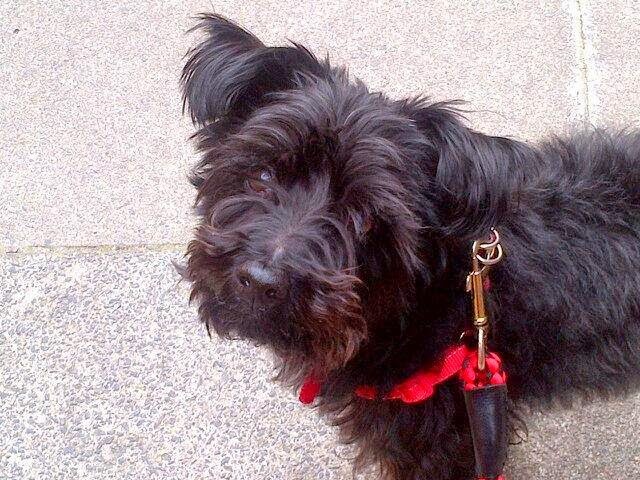 (For those of you who haven't read about Shortie yet, I introduced him to all my readers in the following blog post). The food we were sent was the "Tender Chicken and Vegetables" flavour of Hill's Ideal balance. This is a complete dog food and can be fed as is and doesn’t need to be mixed with dry food. However for Shortie we decided to keep feeding him a mix of wet and dry, with the Ideal balance replacing his regular wet food selection. Dishing out a portion into his bowl and you see a mixture of meat and vegetables in a gravy style sauce. The vegetables are very obvious and identifiable as carrots and peas. It also looked like it had barley in it, but looking on the ingredients it looks like this is probably brown rice. The meat is largely cubed and pink (despite the flavour, the meat is actually a mix of chicken and pork) and there is plenty of it. All in all the appearance is good and pleasing to the eye, not that Shortie cares about that. Before letting him eat he has a handful of dry food mixed in. Subsequent meals have been similar; when he eats he more often than not leaves a clean bowl. Like I said at the beginning of this, it is obvious when Shortie likes something - and it is obvious that this has quickly become a favourite of his. For a dog Shortie's size it's recommended for him to have one and a half cans a day; but as he's fed a mix of wet and dry food a can lasts between one and two days - or up to four meals worth! 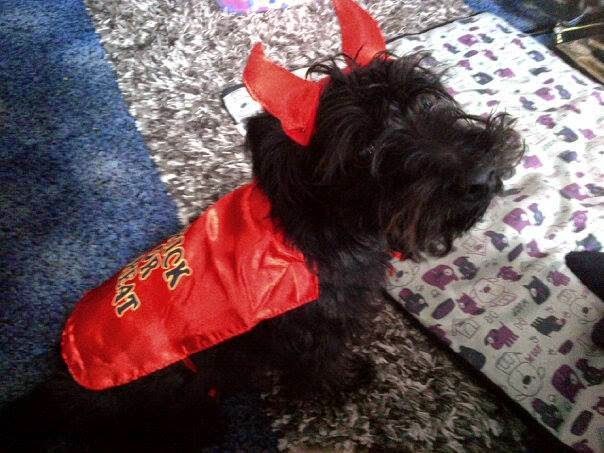 As a dog owner I have to praise the appearance, smell and composition of the food. It looks and smells like a quality product and one I'd be happy to recommend to other dog owners. This summer my niece introduced me to the craze of looming. Everywhere was selling loom bands so I thought I would give it a go and make a few bracelets which I did a post about before here. Little did I know that I would really enjoy it so much. For anyone who knows me I am not really a very creative/arty/crafty person (my sister is more into it with knitting and sewing) but I find this really relaxing and fun. 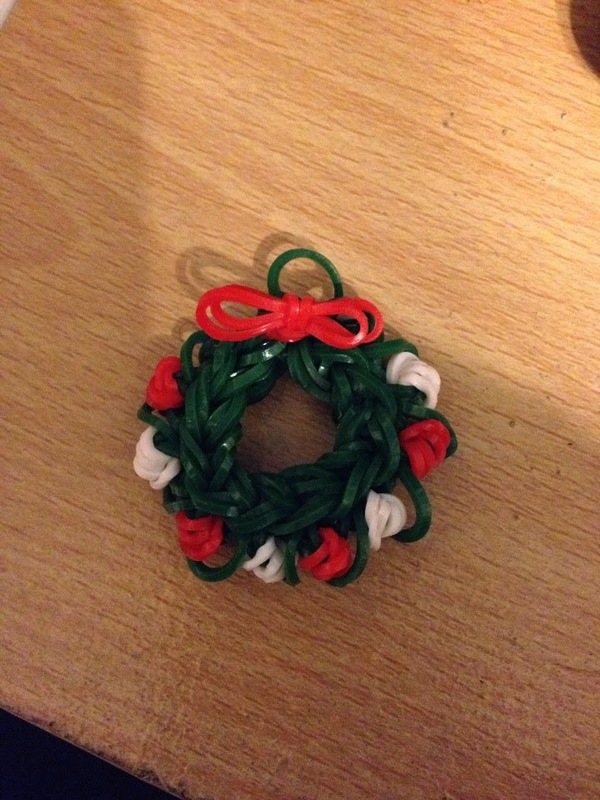 I have found some great loomers on YouTube who I admire and I follow their tutorials to make lovely little charms. Here are some of my favourites I have made. My favourite animal in the whole world is the penguin. So I started searching for loom charms and I came across the talented DIY Mommy's Channel and this tutorial to make these cute charms. After making these I went on to make a stuffed version (tutorial here). 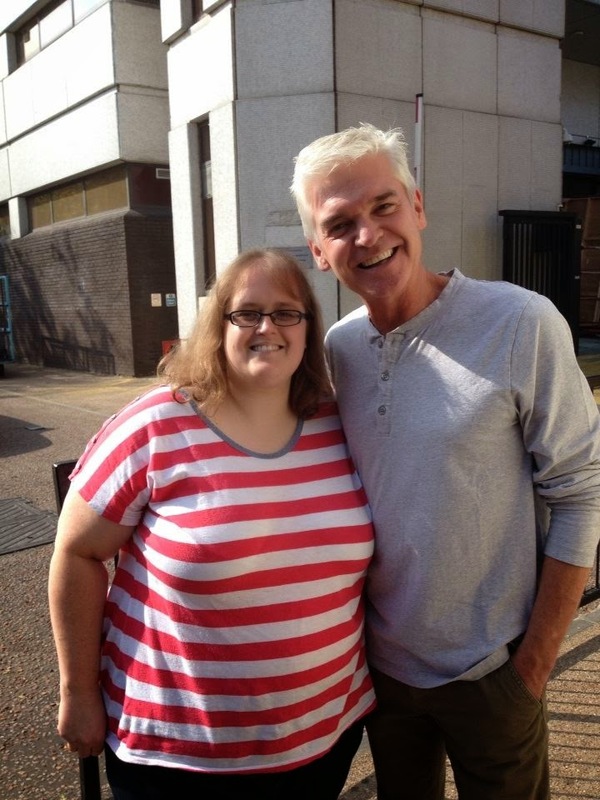 I stuffed him with cotton wool. 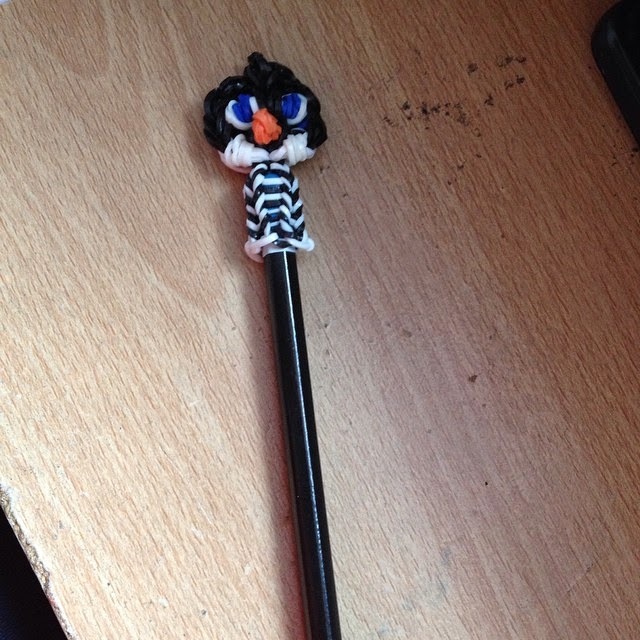 And I also made a penguin pencil topper which is so cool. I might make some of these for my nieces and nephews for Christmas as a cute little gift (tutorial here). 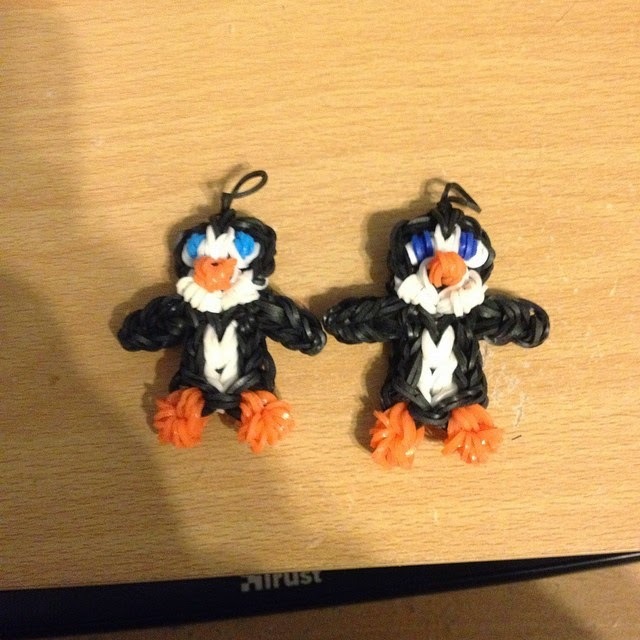 I also found these great designs of DIY Mommy's Channel - A cute little rubber ducky, he can float but he falls over. I kind of messed up a little bit on the beak. 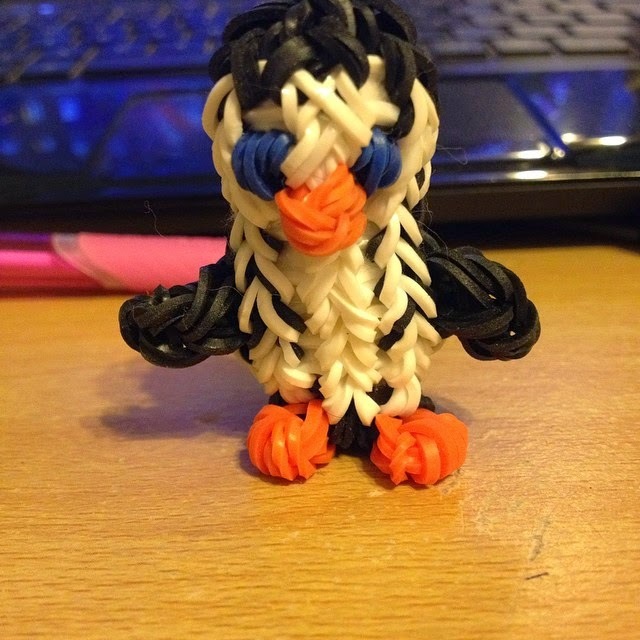 I stuffed this one with loom bands as cotton wool would get all soggy in the water (tutorial here). 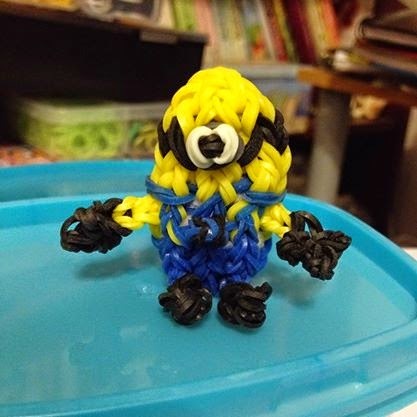 I have a friend who loves Despicable Me so I thought I would try to make her a loom band minion. It turned out pretty well (tutorial here). I found this fab Olaf charm on the BestChannel4Kids. 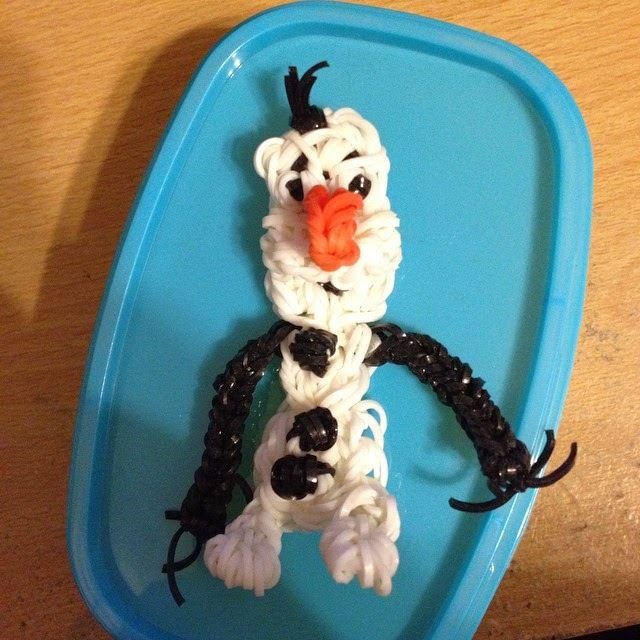 Frozen is such a fab film and I wanted to make an Olaf. He didn't turn out bad but I think I made a little mistake somewhere (tutorial here). One of my favourite loomers is Kate Schultz of Izzalicious Designs, you can find her youtube channel here. 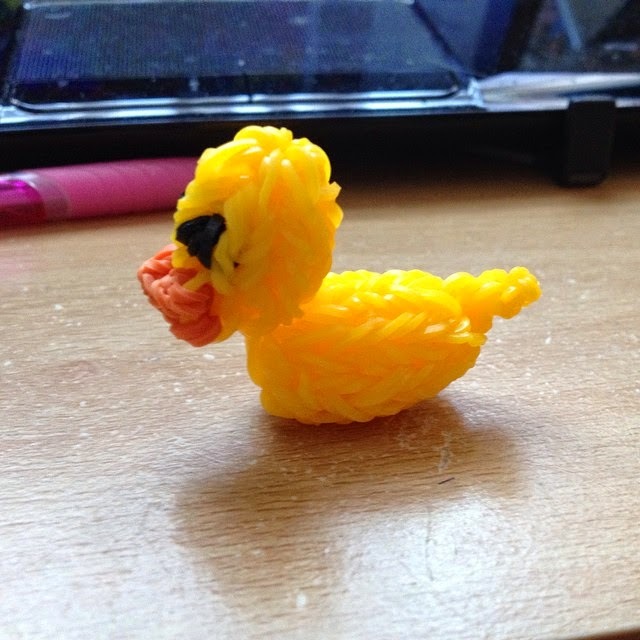 I am still trying to master one of the techniques she uses called Amigurumi crochet but here are some of the loom bands I have made using her tutorials. First up this gorgeous Christmas Wreath. It's nice and easy to make and will look great hanging on the tree (tutorial here). 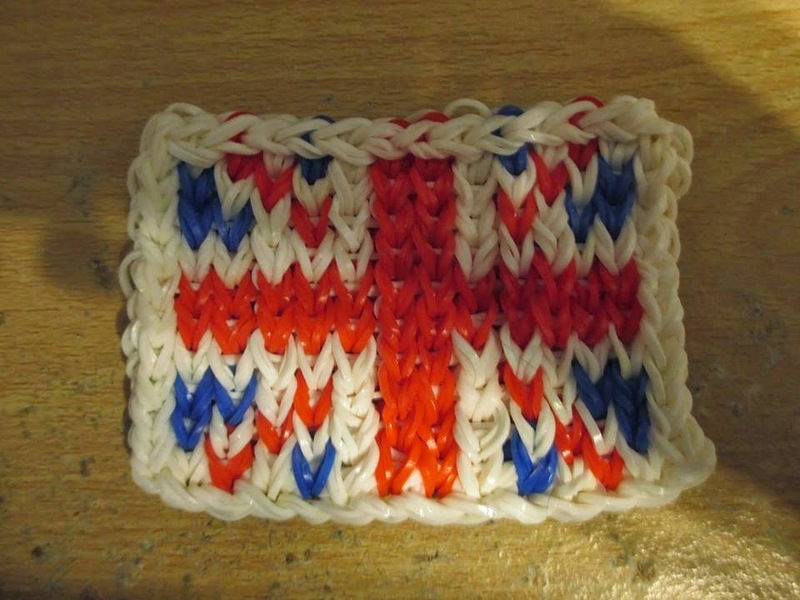 A few weeks ago I was up all night with a bad cold so I came downstairs and decided to try the move it forward technique to make this amazing union flag design (tutorial here). 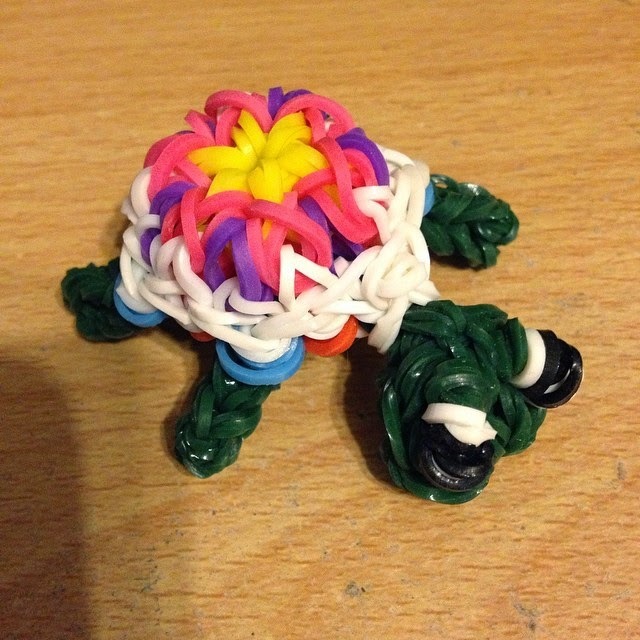 But my favourite design of them all I found on Feelingspiffy's channel and it's this turtle. They are amazing. I have made three so far and given two to friends of mine (tutorial here). Looming is so much fun. Thanks to the amazing designers out there who put up the tutorials on YouTube. It's been a month since I did my last wins of the week update. I haven't been entering as much in the last month as I was away in London for a few days and I have been suffering from my fatigue a bit but I have had a few wins arrive. I hope to start entering more. I find that winning on Twitter and Facebook is becoming harder with more people entering but I guess that's the way it is and of course the few sad people out there who cheat to win with either duplicate accounts or bots (especially on Twitter) which I would never do...where's the fun in that! 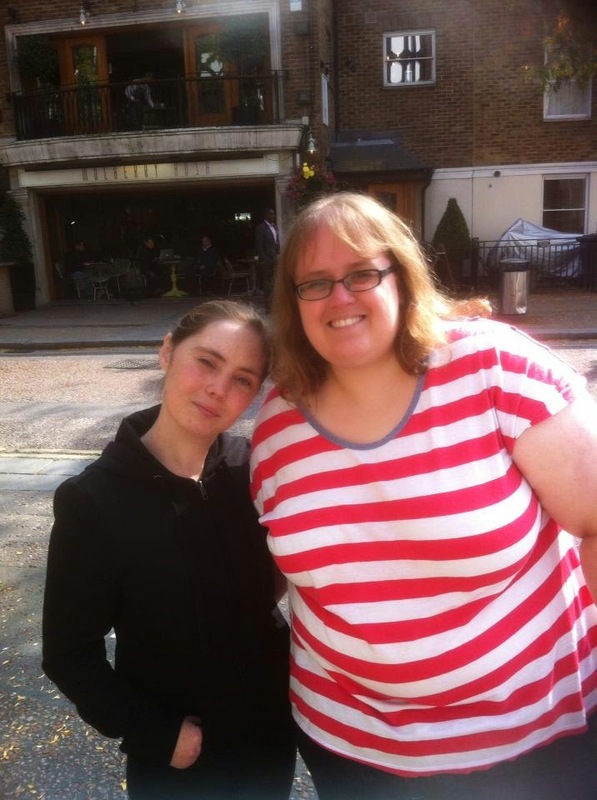 Competition prize win number 1164: I won a signed copy of Geek Girl by Holly Smale from Harper Collins. 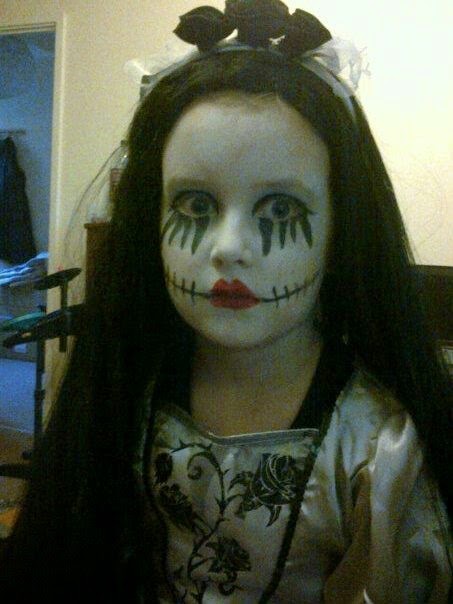 I think it was in a World Book Day competition. I believe this book is for teenagers but I think I will read it myself. I have added it to my pile of books to read. I love reading. 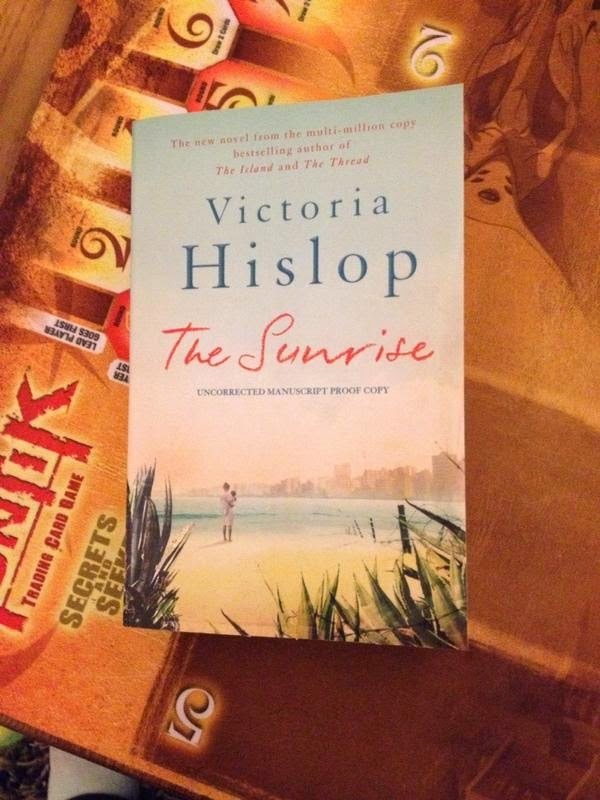 Competition prize win number 1165: I won a signed proof copy of Victoria Hislop's new book - The Sunrise from Lovereading on Twitter. I am currently reading this and it's great. I love winning books like this that I probably wouldn't pick up in the shop but then turn out to enjoy. It's great to discover new authors. Competition prize win number 1166: A £50 John Lewis voucher that I won from a Tots 100 Twitter Party. I'm so glad this arrived as Christmas is coming and it means I can at least get one present for Neil or my family. 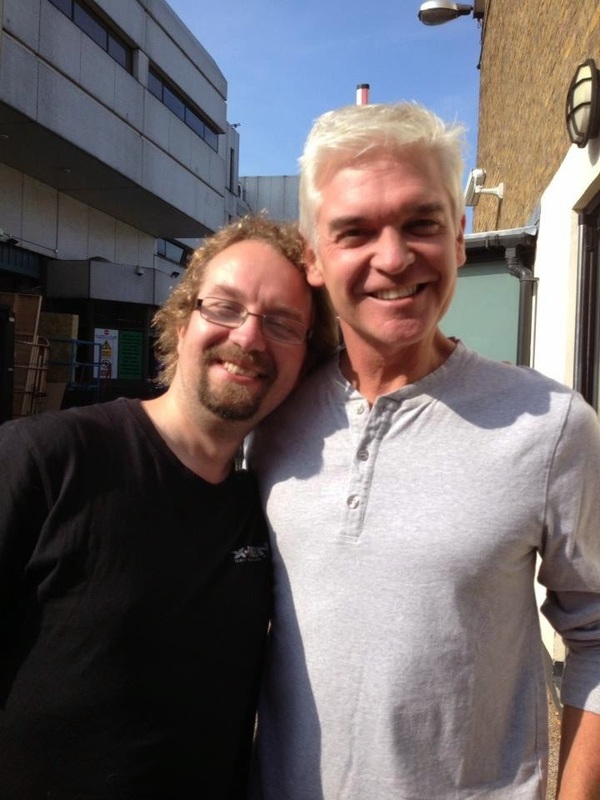 Not sure what I will spend it on yet but if for Neil I might buy him a Nintendo 3DS game. Competition prize win number 1167: A Babybel mini football arrived. I have done well on winning footballs this year. I did enter their competition on the packets but didn't win so maybe I won this on a late draw. Shortie is loving pushing the football around the living room with his nose. Competition prize win number 1168: I won The Smurfs 2 on DVD from The Baby Website on Twitter. I am sure my nieces and nephews will love this one. Competition prize win number 1169: Two Chicago Town pizza vouchers from Chicago Town on Facebook. Yummy! Competition prize win number 1170: I won Rimmel Scandaleyes Mascara by Kate Moss. I think I won this from voting on a Beauty survey in The Sun. I think there was quite a lot of them to win so I hope some of my comper friends won too. 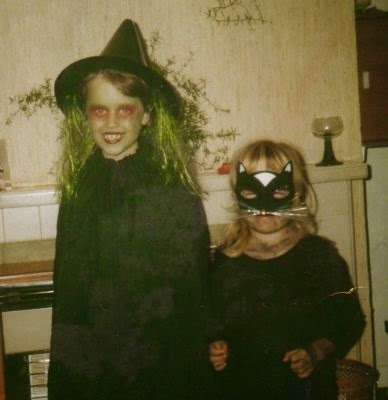 I am sure my sister will claim this because I don't wear make up. I really should learn how to apply it one day, it's a bit sad being 35 and not knowing how to put mascara on! Competition prize win number 1171: And finally I won this awesome Voodoo cushion from Boingy Cushions on Twitter. The cushion is so lovely and big and boingy. I love it. They also have lots of other great designs on their website. And that's all my wins for now. I also have a competition running on my blog at the moment to win some goodies from London - click here to enter - I hope to add more competitions to my blog soon so look out for them. Good Luck everyone for the coming week! Why not leave me a comment of what you have won in the last month. Three bags of Burts lentil waves, one 750g bag of Jordan's simply Granola, two 5-packs of Bahlsen PICK UP! biscuits, two Crabbie's bottled drinks, two bottles of Little Miracles organic energy drinks, two cartons of Carnation 'Cook with it! ', a box of Elizabeth Shaw dark chocolate mint thins, a jar of La Vieja Fábrica marmalade and three flavours of Righteous dressings. The two flavours we were given were "Green tea, ginseng, pomegranate, açaí and agave" and "Lemongrass tea, orange juice, ginger, ginseng and agave" and they were sampled on a couple of different days. They both were great flavours; the "lemongrass tea..." one being particularly nice with its hint of ginger (Neil is a big ginger-flavour fan). They were very refreshing and Neil felt that they contained at least as much, if not more energy than regular drinks. He really liked their flavours and felt that the only problem he had with them is that there wasn't enough! He'd have liked bigger bottles! I think you could say they delivered on their claims of being an anytime pick-me-up. Additionally, if you're interested, they're free of anything artificial and less than 90 calories a bottle. Granola is one of those things that seems to have snuck into the breakfast table selection over the past few years. Essentially we're talking little baked oat clusters; and they taste great! The Degustabox people suggested eating it with a mix of fruit and yoghurt - which we are sure is really tasty, but we like it just as it is with a splash of milk. The bag we were given (750g) contained enough granola for about 8 standard sized bowls, although if you enter into the mix-and-match theme you could easily get double that amount of breakfasts from it. 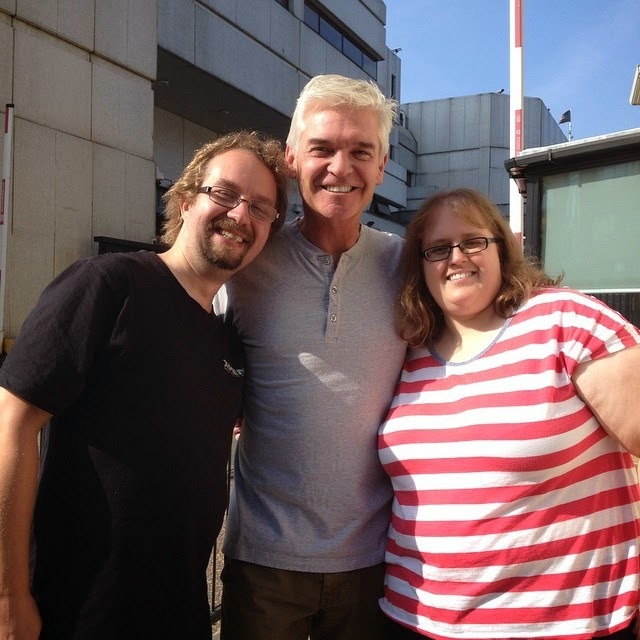 Both of us really enjoyed it and it gets a thumbs up from us. We were sent two packs of Bahlsen PICK UP! bars; the regular "Milk Chocolate" flavour and the brand new "Black 'N' White" Flavour. These come in a pack of five individually wrapped bars, making them ideal for lunchbox snacks. The milk chocolate flavour has two crispy biscuits with a thick layer of chocolate between them. (It is actually a firm, thick layer of chocolate rather than a softer fondant or crème filling). The new "Black 'N' White" changes things around with two cocoa biscuits having a slab of white chocolate between them. The Milk chocolate bars was an instant win. We both loved them and thought it was a great combination. The "Black 'N' White" bars were equally delicious - a great combination that was just as tasty (if not more so) than the regular flavour. With these Elizabeth Shaw Dark Chocolate Mint thins we are in familiar after-dinner territory. However, unlike standard chocolate mints we are not talking thin chocolate sandwiching a mint fondant. These are far more classy with a delightful and generous dark chocolate base with a smattering of crunchy mint sprinkles on top. The 100g box contains 18 chocolates which should be ample for most small gatherings, assuming your guests can restrict themselves to one or two chocolates each. There were three bags of Burts Lentil waves in our box; we're already fans of Burts traditional crisps and couldn't wait to tuck into these. First up we tried the lightly salted. As the 'waves' are made of a mixture of lentil flour and potato starch (plus flavourings) we thought it best to try the most 'natural' version of them first to get a feel for how these differ from standard potato or corn chips. The lightly salted lentil waves have a subtle, not unpleasant, flavour to them. This is most likely the taste of the lentil flour filtering through. They were crunchy and really quite enjoyable and seemed significantly less greasy than the regular potato crisp alternative. 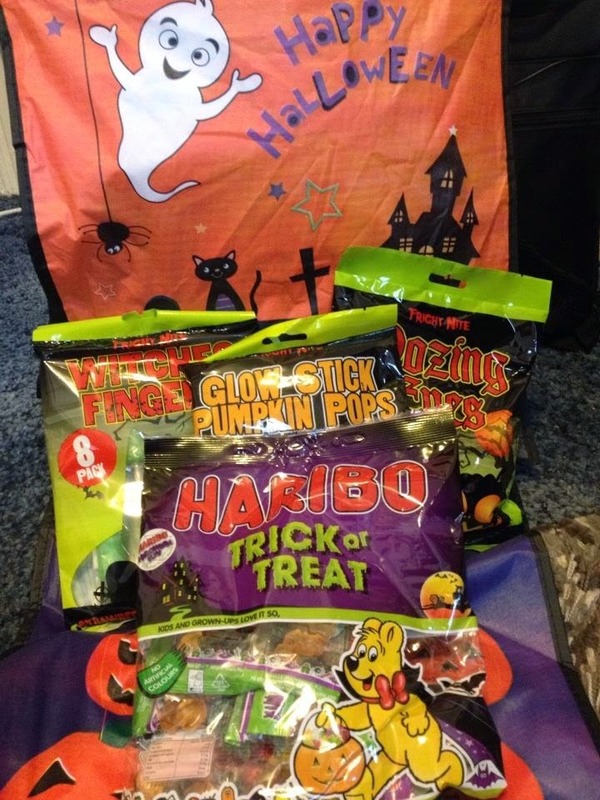 Additionally we should mention that they are less than 99 calories per bag for those who count such things. Having tried the lightly salted we moved onto the more flavourful versions, the sour cream and chive and the Thai sweet chili. The Thai sweet chili was very flavourful; a nice flavour that grew in intensity with each bite - but never achieving an excessive level of heat. Warming and tasty! The sour cream and chive were just as good. We thought that all the flavours were great and that the "lentil waves" made a great change from regular crisps. I should own up here; when we opened the Degustabox we mistakenly took these dressings for dips to be used with vegetables or crisps. A lesson here to read the packaging/box contents list and not just assume they're something based on what they look like. We were sent three flavours, Lemon and mustard seed, raspberry and sweet basil and finally, mild English blue cheese and cider. First up we tried the blue cheese and cider dressing. What we've noticed in the past with these sorts of dressings is that they either sit on the "not too cheesy" or the "very cheesy" side of the fence. This sauce is definitely more on the "very cheesy" side with a definite stilton-ish flavour going through it. Very nice and tasty! Second one to be sampled was the Lemon and mustard seed which was brilliant and worked well; our final one was the raspberry and sweet basil. I'm going to be honest, we were a little apprehensive - it didn't sound like a regular salad dressing... but it worked well, it was a little sweet but full of flavour and worked well with the leaves we'd selected for the salad. Not something we'd've usually gone for, but now we've tried it there's no stopping us now. As this is a sample box we received one bottle of the alcoholic Crabbies and one of the non-alcoholic John Crabbies. The alcoholic flavour we received was the Zesty Lemon; the non-alcoholic flavour we received was the Scottish Raspberry (with a hint of Ginger beer). Both are best served chilled. The Zesty lemon was a delightfully cloudy alcoholic lemonade. Slightly dry but full of flavour (unlike some brands of fruity alcoholic drinks). The Scottish Raspberry with a hint of ginger was wonderfully refreshing. (We sampled this at the same time as the Righteous raspberry and basil salad dressing - it seemed the ideal drink to complement the meal). We're occasional marmalade-on-toast people, so we rotated the La Vieja Fábrica marmalade into our regular breakfast selection. This shredded marmalade has a slightly bitter taste to it and is a great pick-me-up/wake-me-up in the morning. All in all we would say that September's Degustabox is incredible value for money. It had a brilliant selection of items in it, many of which we probably wouldn't have picked up for ourselves; which is where the box is great. We have been able to sample a whole bunch of flavours we otherwise would have passed by on the shelf (and have made a few new favourite flavour-friends) and it's an experience we would love to repeat.